For a class assignment, I was to eat a meal at the Scott Mission, a soup kitchen. This was to help us understand better what a homeless person goes through. As I got ready that morning, I put on my grubbiest clothes and decided to take transit across town. Driving to the mission somehow didn’t seem to fit. As I waited for the streetcar at the corner of Queen and Sherbourne, (a popular intersection for the homeless) I looked at the clothing many of the street people were wearing - most of the clothing was better, was cleaner, and more stylish than the outfit I had on. But still I stood out. As much as I had tried to look the part as I went to get my meal - I didn’t. It wasn’t about what I was wearing or how dirty my clothes were. The difference, I observed, was in my face. what I was doing in the moment. I had been trying to blend, after all. As he went on his way, the man across from my table spoke up for the first time, "Ah, he uses that line all the time..." he chuckled, partly to me, partly to himself, "you don’t see faces like yours around here much." Faces like mine. There it was again - my face. Life on the street is hard. It wears a person down. No matter how much you dress up or dress down a person, the lines on our faces tell of the journey we’ve had. No matter how much a person might try, it follows them forever. I don’t think you can fully understand what a person has gone through unless you walk in their shoes. Even then, you can only relate so far. To help our CSM Toronto summer staff better understand homelessness, on day two of their training this past June, they were sent out to "be homeless" for a weekend. This was in conjunction with the summer team at Evergreen (where Chris works) While out walking the streets, Jemica and Jennifer were pulled aside by a Green Peace worker who was trying to recruit them. He started the conversation and asked lots of questions trying to get them to sign up. He prodded so much it finally came out that the girls were working with CSM that summer and living on the streets for the weekend. Since they were working with the homeless and marginalized they wanted to experience the other side of service. That’s why, they explained, .we are dressed like this...Oh, the guy replied looking them over, .I didn’t actually notice. I just saw young faces.. Try as we might, we make all sorts of judgments by outward appearances by the faces we see. James asks it well (2:1), "My brothers and sisters, do you with your acts of favoritism really believe in our glorious Lord Jesus Christ? "* Interesting, eh? James asks hard questions. He seems to be asking if we can really believe in Jesus if we favor some people over others. If we treat one face different than the next. My prayer is that our actions as Christians will speak for themselves, and say to the world, "We believe!" •I am going to get/make blankets and give them to the homeless. •God has taught me to have a more sincere and humble heart for service, and a renewed compassion. •God has re-affirmed my call to do missions work. •I have realized I need to do more of God’s work. I need to give more of my blessings to others and volunteer in my own community. That’s all pretty remarkable and absolutely none of this growth would be possible without God’s amazing power and your prayers. I was able to give him a Bible. I’m thankful for the opportunity to be able to share God’s word." It’s amazing to me how much more powerfully we bring the Kingdom to earth when we’re unified. I’ve seen not only a deep personal transformation in our staff members because of this, but our groups and sites have also been profoundly affected. What a joy it is to know that this type of community can still exist today. I consider it a great gift to be a part of something so exceptional and extraordinary! "Social justice has become a buzz phrase in Christianity lately. Halting global injustice seems to be one of the foremost concerns of young Christians, and its emphasis is changing the face of the Church from the way it engages society to the way it engages politics. 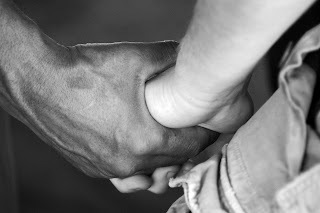 But is our emphasis on social justice detracting from other areas of the Gospel?" Today was a great day in Toronto. The weather was beautiful, my CSM team was amazing yet again, and I got to experience several different aspects of urban ministry that touched my heart. Towards the end of the night, we experienced what CSM calls L.I.F.E Skils - "Living in Faith Everyday". 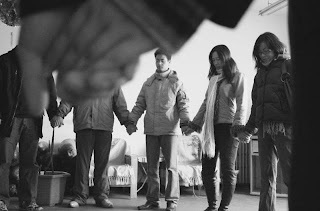 This is a program that every group will do at least once while they are in the city serving with us. The basic concept is that we as Christians should live out our faith at all times in very practical ways. Three components of L.I.F.E. Skills are prayer, service, and storytelling. We should be people who dance with God, people who give to others without reason, and people ready and willing to tell our own story when the chance arises. So, our team broke into two groups - Jake and I, and then Jennifer, Jemica, and Jessica. We had two hours to lead ourselves in this exercise. Jake and I went to a park that overlooks the skyline of Toronto and talked about our excitements, fears, concerns, struggles, etc. for the summer and for life in general. We then walked to a bridge that overlooked the Don River and prayed for each other, the rest of our team, the city of Toronto, and other things. We then looked for ways in which we could act out our faith in a gift of service to someone without asking for something in return. Well, Jake and I couldn't really find anyone in need of help. 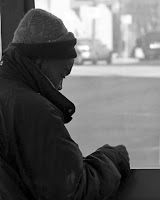 So, we decided to talk to a guy who was probably homeless sitting on a bench by himself near St. James Anglican Cathedral on the corner of Church Street and King Street. His name was Fred. Fred was genuinely nice, eager to talk to us, and shared a lot of wisdom about Toronto. We chatted for about 25 minutes and before we left we invited him to Sanctuary (a really cool church/community downtown), and I gave him the only thing I had in my pocket…a token for the subway. Looking in retrospect, Jake and I didn't really accomplish the mission of the L.I.F.E. Skills challenge. We didn't actively help someone for no reason, which was supposed to lead to our "storytelling" of why we were helping them in the first place. Instead, we had a conversation with a really cool guy in a churchyard. But, I think we served Fred more than we could have imagined at the time. We assumed he was homeless because he definitely looked the part. There's no way of knowing, but we could have been the only people to acknowledge him or have an actual conversation with him. I may have been the only person to give him something that day. Or, maybe we were the 50th to talk to him, and maybe he didn't need my subway token. But that doesn't matter. What matters is that we saw Christ sitting on that bench, and we showed him love. We asked his name, we shook his hand, we laughed with him, and we gave him all that we had. Fred may never see us again, and he may never remember us. And that's okay. I guess sometimes you really do have to be taken out of your comfort zone in order to realize the reality of seeing a bigger picture. Today I had a lot of time to reflect on the power of prayer. I am so glad to know that I can talk to God and trust Him with everything. I am glad that He is bigger than me and He is great in power and grace. I am ready to humble myself and say that I have always wanted to go do missions in a different country. For some reason I wasn't really willing to look at the fact that maybe America had some of its own issues that needed help. I have been in California for a little over a week but I have quickly realized that the world is a lot bigger than it seems and that there are a lot more issues here than we think. We think in America we have freedom and we have money. In reality we have freedom, chaos, functional slavery, and poverty. We just seem to do a better job at hiding it in the media. I am sad that I have been so blind to it for so long, but I am glad to know that I can learn about it now. God is really beginning to show me that it really isn't my plans that make the difference in my life, but that it is His plans that make the difference in my life. I have seen God work in the midst of a lot of things and I know He can and will work in the midst of this summer. Praise God for the opportunity to get uncomfortable, find my cross, pick it up, and follow Jesus. The New York City Coalition Against Hunger "represents New York City's over 1,200 soup kitchens and food pantries and the 1.3 million low income New Yorkers who are forced to use them. The Coalition works to meet the immediate food needs of low-income New Yorkers and enact innovative solutions to help them move "beyond the soup kitchen" to self-sufficiency." NYC's Coalition Against Hunger keeps up an awesome blog - check it out! You'll find articles relevant to meeting the needs of New Yorkers who face hunger and ways you can help partner. Learn how YOU can serve in NYC alongside these organizations and make a difference! Well what an amazing summer this has been so far. I have been blessed with a wonderful group of staff from all different places this summer all here for one purpose to play our part in returning faithfulness to Christ our Savior. One thing I have always realized is that no matter what I'm doing or even when I'm completely unsure of what I will be doing - what I do know is that God is FAITHFUL and He always will be and I can rest easy on that. Living in the Bay this summer has at times been so overwhelming and stressful that I often find myself feeling as though I really am drowning in the Bay that is only miles away. Then all I have to remember is that God is stretching out His hand in those trying times and pulling me up from the water and telling me to swim. Somehow I find myself being able to start swimming all over again, swimming when it seems like I have nothing else in me. I believe God has placed me here this summer to get the full picture of what I should be doing in the future. Whether that be doing work like I am here in San Francisco, or whether that means going overseas to help in similar ways. What I have noticed throughout life, but especially this summer is that God is working here in the Bay Area, as much as he is working back home in Idaho or Oklahoma, as much as he is working all the way in East Africa. God continues to show me this by placing people into my life that come at just the right time. This summer I have, in every sense of the word, been blessed with incredible serving groups. From places like Colorado, to Seattle, to small towns in Idaho, and even Spokane, WA youth have come to serve. What they often figure out by the end is that they did serve, but they often leave with a lot more than they may have given out. I encourage my groups to just break down all their walls and barriers at the start of the week and to just open their eyes to what God wants to show them, and often by the end of the prayer tour on the first night, these youth that just a few hours prior would have never thought of talking to a homeless person, find themselves in deep prayer and actual conversation with the same homeless people they once were afraid to approach. What these youth soon figure out is that there really is no difference between us, and the people we are serving in the Bay area, we are all broken people, the only thing that may be different is we have a place to go to every night to lay our head and get good sleep, and these other human beings often don't. All I can say about this summer so far is that God has completely rocked my world, and turned me in a direction I never thought I would be going. CSM has given me amazing opportunities serving with the youth that came into my life this summer and completely transformed me in miraculous ways. I am so excited for what is left this summer as I finish out my last month in this beautiful place we call "The Closest Thing to Heaven!" I leave you with this quote- "If we come to sleep we are his drowsy ones, and if we come to wake, we are his hands. If we come to weeping, we are His cloud full of raindrops. And if we come to laughing, we are His Lightning in that moment. If we come to anger and battle it is the reflection of his wrath. And if we come to peace and pardon, it is the reflection of His love. Who are we in this complicated world?" One of our students, Cori, was so moved by her experience in Chicago that she decided that she wanted to do a VBS for kids in the poorer section of our town. So in less than three weeks, she organized everything, from lining up Bible story teachers and volunteers, to developing a schedule, to getting small groups to commit to provide food, to shopping for all the supplies, to getting her friends to do everything (games, crafts, etc.). She had anywhere from 12-20 kids attend each of the four days. I couldn’t be more proud of her! Have a cool story from your CSM trip this summer? Email us! One thing I've had to get used to at CSM is the sleeping schedules of my fellow staff members. I am a night owl, and aside from the first week or two here, I have maintained that characteristic! I am usually in bed before midnight, and I rise about 7:30 the next morning. Luckily, I only need about 6-7 hours to function during the day. The rest of the staff goes to bed anywhere between 10 and 11 on any given night. As a result, I find myself walking in the darkness quite often. Sometimes I must tiptoe over sleeping bodies as I make my way to the bathroom to brush my teeth. There have been quite a few nights where I've read my Bible by the streetlight that glows over Pennsgrove Street. I've learned to walk lightly on the creaking floors so as to not wake anyone. The ability to see in the dark has been quite useful in that aspect. On one particular day, I decided to go to Fairmount Park to read my Bible. There was a nice gazebo that overlooked the Schuylkill River. The sun was on it's way down, and it was just a beautiful scene. In the middle of my reading, the light all of a sudden got much dimmer. I was taken aback by the change in lighting, but I realized that it was just because the sun had set behind the trees. That moment, however, made me realize how powerful and in charge God is over the light. He can change the day to night in an instant, but chooses to do so in such a way that leaves us with a beautiful sunset! There has been a common occurrence between me and my groups this summer. I find something very familiar about the people I'm working with each week. It's obvious that I've never met these people before since they are from different states, but something in me is just very comfortable about being myself and interacting with them. I couldn't place what it was until God used a man in the Kensington area to explain this phenomenon. We had just finished the 'Kensington Plunge' and were waiting by the vans to depart. The plunge has the groups split up into teams of 3 or 4. Each person is given $2 and they are asked to go out and meet people. Through conversations and interactions, if they find a way they can bless someone's day with the money they have been given, we encourage them to do so. As this particular man walked by, he stopped, looked at me and my group and said, 'Are you Christians?' We answered him that we were and he said, 'I knew it! I could see it in your faces!' He walked on his way and I could hear him bragging to his partner how he had guessed correctly. The familiarity I had recognized in my groups had nothing to do with whether I met them before or not. It was the fact that they were radiating someone whom I have come to know quite well over the past few years. Through their reflection of Him, I have recognized Jesus in my groups. Seeing in the dark has stretched far beyond my living situation. God has used situations like the sunset in Fairmount Park to show me that He is capable of giving us enough light to see what He wants us to see. He has given me the privilege of seeing His light in the darkest places of Philly, such as Kensington. Finally, the light reflected by my groups has caused me to recognize Jesus working through them. I probably won't go to bed any earlier the rest of this summer, but I can rest assured that regardless of how much light is available, God will help me to see! People generally divide Chicago into three sides: the north, south, and west sides. CSM Chicago used to have north side and south side prayer tours that we would take our groups on the first night they arrive in the city. Our prayer tours are driving tours where we share about the issues and struggles of inner-city life, leading groups in praying over the city. Things have changed so much on the north side, that we are no longer doing our north side prayer tour. So this spring we created a west side prayer tour. The new prayer tour explores various west side neighborhoods, including Lawndale. Lawndale has undergone many changes over the past 60 years. In 1950 it was predominantly Jewish, but by 1960 it was mostly African-American. During this time, many of the businesses began to leave as well. When Martin Luther King Jr. was killed, riots ensued, destroying 75% of the remaining businesses. Between 1960 and 1970 the Lawndale neighborhood alone lost 120,000 jobs. While recent history has wrought the Lawndale community with pain and suffering, God is moving. On our prayer tour, we pause by Lawndale Community Church—a beacon of light to the neighborhood. It was started in 1978 by a local coach, Wayne Gordon, to meet not only the spiritual needs of people but also their physical and social needs. Lawndale Community Church runs a free health clinic that sees 119,000 patient visits per year and a development corporation which rehabs old apartments and rents them out to low-income families. The church has a residential drug and alcohol rehabilitation program to help men break out of addiction and pursue a new life in Christ. They have ministries that reach out to children with incarcerated parents and an after school program which reaches out to the neighborhood kids. These are just a few of the church’s ministries. Many times I wonder what America would look like if every church across America reached out to their community like LCC does. Jeremiah 29:7 says, “Work for the well-being of the city where I have sent you and pray to the Lord for this. For if it is well within the city you live in, it will be well with you.” Lawndale Community Church has embraced this verse and is a living example of how each church should serve the area where God has placed them. Praise God for their faithfulness to the gospel! The San Francisco Chronicle recently published a really interesting article about Tom Sepa - a man who wouldn't fit into the average person's idea of a homeless individual. Tom lives in a local park, but works from his laptop as a telemarketer. Pretty creative! If you've ever been on a CSM trip - you know one of our goals is to challenge your perception of what you think homeless people are like. We hope to not only put a face on what to many may only be a statistic - but to also introduce you to some amazing friends! From the moment these 34 individuals stepped outside their vehicles with hearts and bags full, they had no idea what this week would hold. The first group to arrive was from Michigan, who had already come last year! As their 34 legs stepped out of the vans, you could see the twinkle in their eyes as they braced themselves for “another” week here in Toronto. They were so remarkably impacted by the people they served, the stories they heard, and the things they saw, so much that they took this programming back home to serve those in their own communities. For the second group, they too had come last year; however, it was only a 20 minute drive from their suburbs just outside the city of Toronto. Shortly after their arrival, goodbyes in Chinese filled the air and tender embraces were exchanged as this group of 12 saw their families off. For them this city of Toronto was their very own “backyard”. Where would God take these groups, who would they see and who would they meet and just who would they serve. Together how would God use these relationships to teach them something new about the city of Toronto? Some of you may never come into direct contact with the streets of Toronto; however, you too can be part of this amazing adventure. Simply by hearing some of these stories can cause you to dive right in and get your hand soiled in prayer. Here you will hear the joyous cry of some and heartfelt laughter of another. That’s right! Through prayer you are right in the action laboring alongside us calling out to our Heavenly father. This is just a glimpse of the adventure God has taken us on. "May it be Your will, Lord, My God and God of my ancestors, to lead me, to direct my steps, and to support me in peace. Lead me in life, tranquil and serene, until I arrive at where I am going. Deliver me from every enemy, ambush and hurt that I might encounter on the way and from all afflictions that visit and trouble the world. Bless the work of my hands. Let me receive divine grace and those loving acts of kindness and mercy in Your eyes and in the eyes of all those I encounter. 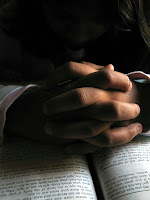 Listen to the voice of my appeal, for you are a God who responds to prayerful supplication. Praised are you, Lord, who responds to prayer." Until then Peace and Joy! 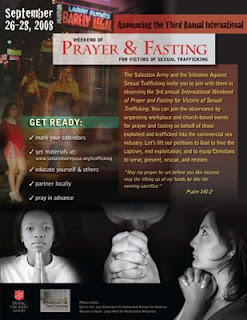 The Salvation Army and the Initiative Against Sexual Trafficking have partnered to invite believers worldwide to join in prayer and fasting for victims of sexual trafficking. The event will be held the weekend of September 26-28 and invites churches, para-church organizations and individuals to participate. Past participants have joined from have had participants from Macedonia, Venezuela, India, the Philippines, the United States, Canada, Mexico, the U.K., and Germany. Please visit their website to learn more. Download a promo poster in English. Download a promo poster in Spanish. Download a promo poster in French. "Is-is he a man?" asked Lucy. "Aslan a man!" said Mr Beaver sternly. "Certainly not. I tell you he is the King of the wood and the son of the great Emperor-beyond-the-Sea. Don't you know who is the King of Beasts? Aslan is a lion - the Lion, the great Lion." "Ooh!" said Susan, "I'd thought he was a man. Is he - quite safe? I shall feel rather nervous about meeting a lion." "That you will, dearie, and no mistake," said Mrs Beaver; "if there's anyone who can appear before Aslan without their knees knocking, they're either braver than most or else just silly." "Safe?" said Mr Beaver; "don't you hear what Mrs Beaver tells you? Who said anything about safe? 'Course he isn't safe. But he's good. He's the King, I tell you." I love this reminder of God's character. Sometimes the places in which we encounter God in the city are the most unlikely - often times they're not the most beautiful, the most clean or even the most safe, and the things we're asked to do might even be a bit risky. Perhaps, though, it's when we're away from some of that comfort that we're inclined to fine-tune our vision and our hearing to experience Him even more. Perhaps that's even when we see God working the most powerfully. Amazing how that works - is He safe? Maybe not. Is He good? Oh, yes... He's very, very good. 1.) Challenging is good, the harder the better in the end. 2.) I am loved by a God whose love is bigger than I will ever know. 3.) Community is a constant work in process and it takes a lot to keep Satan from having a foot hold. 4.) Small things do make a difference. 5.) Encouragement & Motivation go a really long way even f at first they don't seem like it. 6.) There is a big difference between sympathy and compassion. 7.) Love is the key to true service. 8.) We have to want to grow in order to be able to. 9.) Once in a while we need to take the risk and stand on the edge daring to be different. 10.) Failure is inevitable it's what you do after you fail that matters. 11.) God must be at the core or all things will fall apart and despair will set in. 12.) We must continually make space for God. 13.) If we fail to acknowledge & use the gifts God has given us we are not being obedient to the calling God has given us. 14.) We must always continue to be teachable because learning is always a necessity. 15.) Even when we feel we are always in a "God environment," we must continue to seek alone time with God in the Word and in prayer. 16.) Injustice is cyclic and at some point we must stop putting a band aid on a problem that needs a surgery only our God can fix. But isn't the band aid doing some good? 17.) Every person has value and worth because we are all made in God's image and to deny that is a sin. 18.) We must seek to find our identity in God not in others. 19.) There is always an opportunity to love. 20.) Finally I have learned to believe in myself because God believes in me. I'm sure there are many more things I have learned but this is just what comes to mind. I can't believe the summer is already ending and a chapter of my life is through. I am so grateful for all things that happened this summer, even the challenging ones which made me stronger. I am grateful for all the wonderful people I met, and for the relationships that I hope can only grow stronger. I am thankful for the opportunity to see God at work in the city of Los Angeles and to know that God is always at work here, even when I'm thousands of miles away in Chicago. It's also comforting to know that God is working in Chicago and has a reason for having me go back there for one more year. This summer for me has affirmed a calling I have long been putting off. A calling to recognize the needs of the inner city and the fact that there are people who need to be loved there to. I came out here with the idea that "real missions" were outside of the US, I heard otherwise but I wasn't sure about that. God has completely changed my heart this summer and taught me how to be compassionate about what I see. He has taught me the response of humility and of willingness. I see Jesus everyday through my groups as they are serving, through the people we are feeding, the kids we are hugging, and the service we are doing. God is all over this city. You can find him in the top floors of the financial district, at the water courts, in the library, out in Hollywood, resting on the beach in Santa Monica, hanging out with sister Luz, playing with kids at Los Familias, Lighthouse, Wyvrenwood, Faith in Christ, Red Shield, Hollywood Boys & Girls, SASLA, at the midnight mission, the LA mission, Long Beach Rescue Mission, St. Francis, and all the other ministry sites we serve. You can see him at 7:15 during a breakfast search or 10:15 during a meet a need. You can find him hanging out down on San Julian in skid row or singing karoke at Central City Community Church on Wednesday nights. You can see him at 5533 Long Beach Ave. over by the train tracks on Slauson. You'll find him down in Compton and on Grape street in Watts. God is everywhere and his people are everywhere trying their best to be his hands and feet in a pretty messed up world. I'm sad to leave but I know that God is still here and there are still people here who care about this city and who will continue to serve. My service is for another time and another place for the next 9 months and so humbly I will accept that and go where I have been called, even if it doesn't sound at all like what I want to be doing. Where's all the fresh food?? For most of us in the United States, access to fresh food is never an issue or concern. Unfortunately, for those living in urban centers, like San Francisco's Tenderloin District, there are no grocery stores nearby. Imagine having to get your week's groceries at the corner store where their main stock is liqour and tobacco. It makes life a little more complicated - especially since the majority of residents don't own a car! The San Francisco Chronicle recently ran an article entitled, "Tenderloin struggles to get local grocery store" - our prayer is that it will raise awareness and that grocery stores wouldn't pull out of areas that are in desperate need of fresh, healthy food. 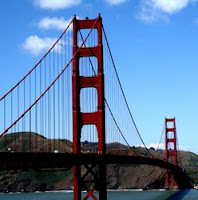 Learn how you can serve in the San Fran Bay Area with CSM!